Elsie Prell put on her hat and golden slippers and went to dance for the angels January 24, 2019. Elsie was born on October 16, 1925 the only child of Helen and John Dexter, of Newcastle, WY. She grew up there, where she lived and married Glen A. Prell in January of 1947. Blessed with 6 children, they lived in many towns across Wyoming and operated their own business in Riverton Wy. Her husband worked the oil fields before moving to Powell in 1979. She was known around the state as the Hat Lady. 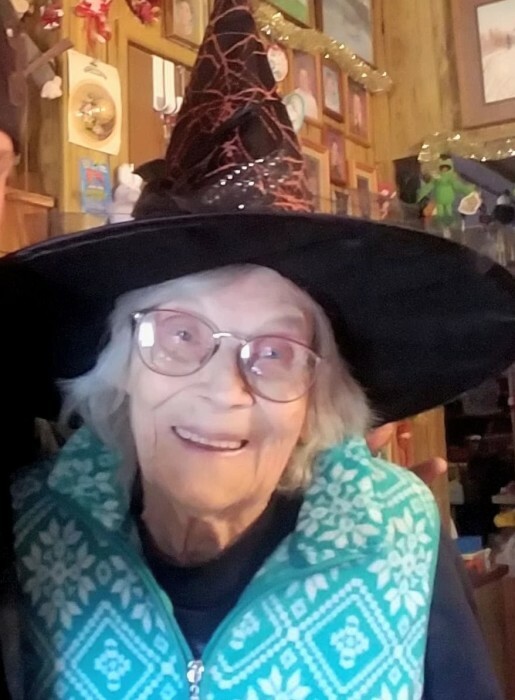 Wearing her vast array of crazy hats, she danced with The Travelers and Old Time Fiddlers, entertaining across the Basin at nursing homes, Cassie’s restaurant, and the fair parade. She helped raise her Great grandsons Devon & Glen Prell here in Powell, who would also dance alongside of her. She was a member of the VFW and the Eagles Auxiliary. Elsie was a charitable woman who enriched the community with her happy demeanor; donating toys to schools and time to the yearly Christmas giveaway. Elsie wanted the world to be a joyful place and left us with the quote “only cry at the happy things.” She was preceded in death by her parents, husband, infant daughter Joanna Rae Prell, and grandchildren Jessie Moore and Jennifer Chase. Survived by children Glenda Moore, Spokane Washington, Joy Johnson, Rapid City, SD, Daniel Prell, Powell, WY, Sandra Prell, Powell, WY, John (Diane) Prell, Indianapolis, IN. Eight grandchildren, twelve great grandchildren, two great-great grandchildren, and a multitude of friends she considered her grandchildren. Celebration of her life is planned for the spring. Memorials may be sent to P O Box 819, Powell, WY 82435.